Sawtooth pellet grills are made in Idaho, USA and are aimed at the budget, 'no frills' end of the market. This is their first production version which was unveiled in February 2011. Temperature control is achieved by a dial which adjusts the feed, and the thermometer on the hood has to be watched. When you've got the temperature you want constant, you can leave it to its own devices. 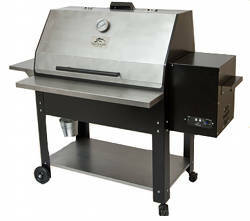 The basic Sawtooth grill comes in black powder coating. Options are a stainless steel front shelf, side shelf, bottom shelf and hood. It is possible to over-fire this grill which can cause damage to the powder coating. Dimensions H 50" W 47" D 22"
Temperature control Manual, watch the thermometer and adjust the pellet feed.